I have owned every Kindle that Amazon has ever produced (except for the first generation Kindle Oasis which, in my view, had way too many flaws), but there are several that are dear to my heart. One is the ancient, final keyboard model. Another is the Oasis 2 (2017) which is just about perfect. But the third is the Voyage, last remodeled in 2014. It’s the smallest model ever that has all the features you want: page turns in the bezel, a flush bezel to screen, fine screen definition and lighting, and oh so lightweight. I may pick up my Oasis first, but my Voyage is always nearby in the event of a need for a backup or a desire to travel really light. If this commentator is correct, this removal from the Amazon Kindle lineup will be a loss to many serious readers. For a few years, the Voyage was Amazon’s flagship e-reader. While it was never cheap, its 300 PPI resolution and fantastic design often made it a better buy even after Amazon released the first Kindle Oasis in 2016. 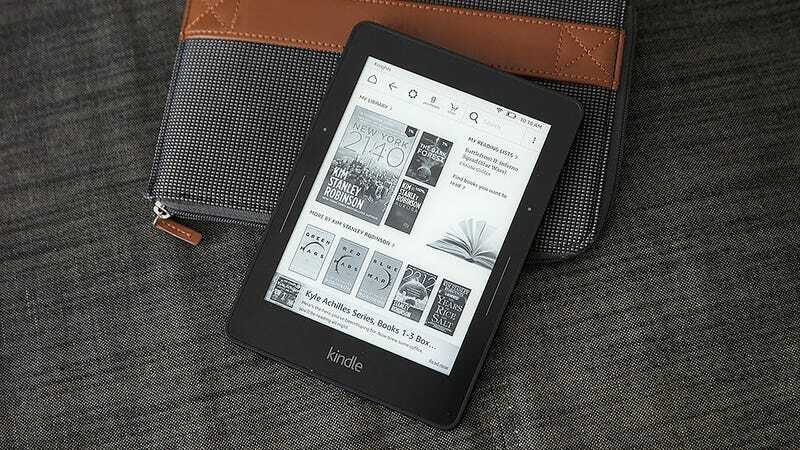 However, it seems time and the emergence of the second-generation Kindle Oasis have put an end to the Kindle Voyage’s run because after supplies of Kindle Voyages dried up in the U.S., UK, and other major Amazon portals, it seems like the Voyage is being discontinued. First spotted by Goodreader and the Ebook Reader, the demise of the Voyage would mean the new Oasis will sit unchallenged atop Amazon’s Kindle hierarchy. This makes sense because, with a larger, seven-inch screen, support for Audible audiobooks (an update the Voyage never got), and built-in water resistance, the Oasis kind of has everything. Though at the same time, that would mean there’s also a noteworthy hole in the Kindle lineup now, between the standard $120 Kindle Paperwhite and the $250 Kindle Oasis. Thankfully, there are still a few certified-refurbished Kindle Voyages available, and with a price of $130, I’d take a Voyage (even a used one) over a standard $120 Paperwhite. If and when supplies truly run dry, it’ll be a sad day, because the Voyage was the first high-end Kindle that really made us think about what a luxurious e-reader could be. Even though the Voyage’s six-inch screen is a little smaller than the seven-inch display on the second-gen Oasis, it has the same 300 pixels-per-inch resolution and its claimed six weeks of battery life is two weeks better than the month-long longevity of regular Kindles at the time. The Voyage was also the first Kindle with adaptive brightness, and it has neat, capacitive touch page-turn buttons with haptic feedback on both sides of the device that could even be configured to suit your tastes. That’s something the new Oasis doesn’t even have, as Amazon opted to use a pair of more standard physical buttons installed on one side of the Oasis’ asymmetrical design, which leads to our final, though quite a subjective point. Yes, the new Oasis is more powerful and has a number of features the Voyage doesn’t, but I still think the Voyage simply looks better. And at 7.6mm compared to the Oasis 9.1mm waistline at its thickest point, the Voyage is thinner and sleeker, too. That statement alone doesn’t confirm the death of the Voyage either way, but I wouldn’t bet on it making a comeback. So maybe now is a good time to pour one out for the Voyage, before it’s truly gone for good. Previous Post Dominica is taking immediate action against plastics — Yay!